University of Idaho Library | What Does Your Library Look Like? Ross Miller is a TA for the University of Idaho Physics Department, a PhD student studying nuclear force field theory, and this year’s Think Open graduate student fellow. The library’s Think Open Fellowship offers funds to assist instructors at UI in using Open Educational Resources, aka affordable or free course materials for students. Ross is using OER in Physics 212 this semester, saving the students in that class from $100 to $300 each. He’s passionate about bringing high quality, low cost textbooks to students and is excited by all the ways the library is helping lower barriers to a great education. 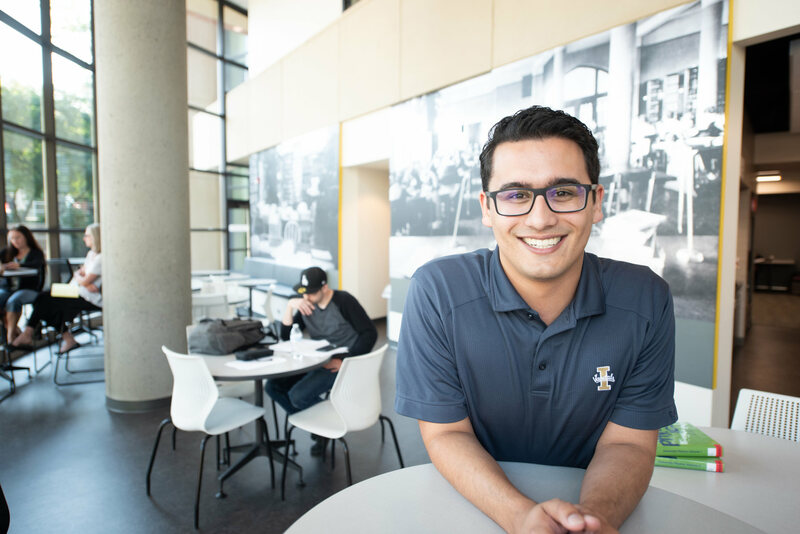 UI Science Librarian Jessica Martinez sat down with Ross in fall 2018 to learn more about his work as a Think Open Fellow and his goals as a student and researcher. How has UIdaho library helped you accomplish your personal and professional goals? The library helps me be a part of a community of people who care about lowering the cost of education to students, improving the effectiveness of methods and procedures for the classroom, contributing to these educational resources. It gives me a lot of exposure to ideas of what to use, what people are using successfully. And an idea of who I can seek out for help. Because I can’t do it all myself. I mean who can? How did you get started with OER? I’m a new instructor, so I have to choose textbooks and develop course materials from scratch. I have a unique opportunity compared to someone with a lot of experience and who has spent a lot of time developing their course materials to a certain book. I get to choose an OER, with a lower cost for students and a community -- at the library but also an international community of people who want to be part of something. There are test banks, examples, homework, example videos. I get to benefit from this larger community as well as contribute. This is an opportunity to change the direction of academia to say if something is comparable and more modern, why not use it? Especially if it’s a cheaper cost or no cost to the student and instructor using it. Although all textbooks have a cost and people should be paid for their work. How has his work with the library and OER helped students? My students benefit from having an Open Educational resource because it’s less money they have to spend-- it’s easing their financial burden, they’re less stressed and have less anxiety. They’re also getting something that’s the same quality and, it turns out, has a more modern take. They’ll be more prepared from when they move on from the UI. They also get a resource that matches their familiarity with technology, many students are familiar with using a computer to use electronic books, ebooks, tablets, their phone. They’re used to being able to search for things really quickly, which you can do in the online version of their open textbook. If they need something for offline there is a PDF they can download with a table of content. So, overall, there are lower barriers to education, it’s more accessible. They get something just as good but not as expensive. They save $100-$120 on a loose-leaf paper edition, but they might save up to $300 on a new hardback textbook. This is about getting students the best resources for the least amount of money. Money shouldn’t decide who gets to be educated and who gets to contribute. What’s next and how will you stay involved with UI Library after wrapping up as a Think Open Fellow? After the fellowship, I expect to still teach at UI, abs or classes, part of my project is creating a culture and provide an onboarding process for the Physics department. They have well established, really good instructors who have tailored their course material to the textbook they use-- they’ve spent more than 10 years developing this, they don’t want to spend another 10 years adopting something new. We can create a communication line and bigger community, not just a few people in the department or at the library who want to lower the cost of education, who realize that there are things of just as high a quality. Nothing is perfect but if there is a better onboarding process for new instructors and experienced instructors it should be easier to create a larger community of instructors and professors using OER. The library can help keep that communication line open and establish that culture. They already value and appreciate open educational resources. Now let’s adopt them, let’s act on it, not just talk about it. What is the main thing you wants to tell someone about your positive experience with the library? I want people to know that the library is full of helpful and inclusive people. For everybody -- student, faculty, anybody. So regardless of who you are, your skill level, program, your title, there is something for you at the library. That might be using a computer or printer, finding books, or learning new things at workshops. It’s a great place for students to study with other students and for faculty and staff to collaborate with other people outside their specialty. And they have way more resources than just books-- there’s website stuff, how to find articles and ebooks online, all these benefits you get as a student at the University of Idaho. They know what’s up.